Image orientation (see below, the “Changing Image Orientation” section). White Balance in FastRawViewer and Adobe formats (see below “White Balance”). Exposure adjustment in the FastRawViewer and Adobe formats (see below, “Working with Exposure”). Ratings and marks (please see below). Title (title) and description (description) of an image (see below). To switch this warning off, unset the setting: XMP - Warn if overwrite XMP for file with same name. When the file is displayed in “Grid View” mode, the sidecar XMP files (those having the same name as the current by with a .XMP extension) are read. When the file data is changed, both XMP sidecar files and XMP blocks embedded into RAW files (for those RAW file formats where such XMP blocks exist: DNG files mainly, but also some other formats) are read, and the most recent XMP data is chosen using the modification date. Only manual changes are recorded into XMP files (for instance, image orientation or exposure are changed from automatic to something else). Preferences – XMP – Use XMP for RAW Files – turning off these settings leads to a complete disregard of XMP files: they are not read, written, and not moved together with RAW files. Preferences – XMP – Read Only XMP – blocks any recording of XMP files. Data (ratings, labels, white balance, exposure correction) will be read and used for display, but any changes to it will not be saved. Preferences – XMP – Force XMP file creation – turns on the creation of XMP files, even if nothing was changed manually. The parameters which were (automatically) set up when opening the file will be set as the parameters in the XMP file. Exposure compensation and white balance are written to newly created XMP files according to the setting of Adobe Process Version in Preferences – XMP – Exposure, Contrast, WB - Adobe process version for newly created XMP files. To set color labeling scheme to be compatible with CaptureOne, set Preferences – XMP – Ratings & Labels - Write photoshop:Urgency tag with color labels (for PhaseOne C1). This setting turns on the recording of the XMP-tag photoshop:Urgency, which is used by CaptureOne to recognize and set color labels. When working with JPEG files, XMP data can be recorded not just as separate sidecar files, but also in the form of data blocks embedded into the JPEG files themselves (this setting has been added because certain programs, for example, Adobe Bridge, ignore XMP sidecars for JPEG files. As with any operation that modifies image files, recording XMP could theoretically damage the file itself (if, for example, a bad card reader is being used), so when turning on the above-described setting, the user is given an additional warning. When using this option, if the JPEG file previously had an XMP sidecar file, said sidecar will be deleted after recording an XMP block inside the JPEG. When using RAW+JPEG mode, one can turn on the setting RAW+JPEG mode: embed XMP block into JPEG. If it’s turned on, then aside from writing XMPs for RAW (as an XMP sidecar), the same XMP block will be written into the associated JPEG file (if there was a different XMP block in the JPEG file, it will be replaced, not combined). XMP files and XMP blocks are not supported for TIFF and PNG files. FastRawViewer, when it’s running, stores XMP data in memory cache. If the XMP data was modified by some external application, the changes will not be automatically recognized in FastRawViewer. Menu – File – Reload – Reload current folder (by default Ctrl-Shift-F4) – will re-read the contents of the current folder, including the XMP and EXIF data, and will also reload the current file, if it exists. FastRawViewer records any changes to XMP data immediately, without any delay. For other applications to recognize those changes you may need to perform some extra actions. Adobe Lightroom ignores XMP files while importing from a flash card (whether it is through card reader or by directly connecting a camera to a computer). Should you need to import changes made in FastRawViewer to Adobe Lightroom, please copy the files to a hard drive first (you can do this using FastRawViewer and selecting only the images you need to copy; corresponding sidecar files, if present, will be copied automatically). Nevertheless, we suggest copying the files to a hard drive before setting ratings, labels, and/or changing any RAW processing parameters, to avoid any corruption of the data on the card caused by sudden losses of power, disconnections, or hardware malfunctions. Again, you do not need to copy everything from the card: you can use FastRawViewer to select the images that you want to copy. Adobe Lightroom ignores XMP sidecar files for JPEG files. In the case of JPEG files, for Adobe Lightroom to acknowledge changes made to XMP data it needs to be embedded into the JPEGs. To do so, please use Write XMP blocks to JPEG files mode, as described above. Select a file or a group of files for which you want to refresh XMP data in a Lightroom catalog. Use Menu – Metadata – Read metadata from files, or the context menu which appears on the right-click, selecting Metadata – Read metadata from files. If the above setting in Adobe Lightroom is off, or the XMP file has been changed by an external application, Lightroom will not record XMP files automatically. To trigger synchronization manually, please use Menu – Metadata – Save Metadata to files or the respective choice from the context menu. FastRawViewer can create basic .rpps files (those contain conversion settings for RawPhotoProcessor). This option is controlled through Preferences – Other – Write RPPS files checkbox. 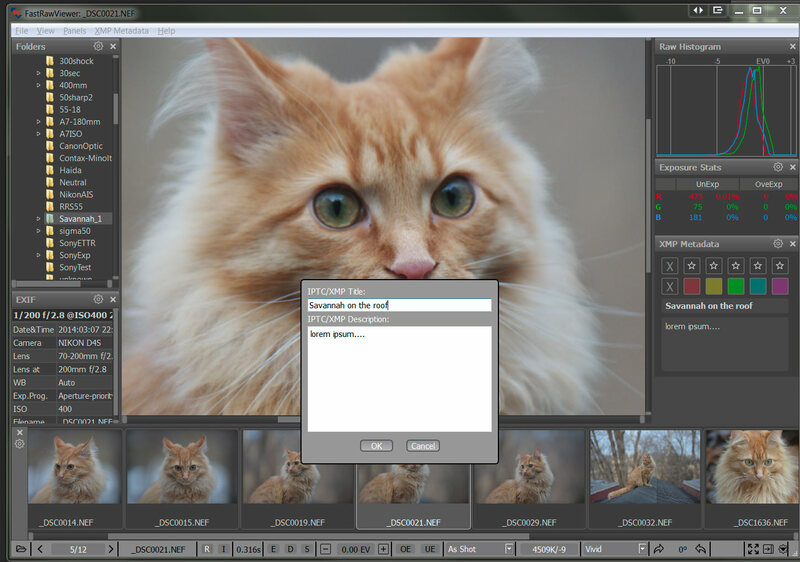 Another checkbox, Preferences – Other – Force RPPS files creation, forces the creation of .rpps files immediately after a RAW file is opened in FastRawViewer, with automatic exposure compensation and current white balance recorded as initial settings. To import such .rpps files for further use, while in RawPhotoProcessor navigate to Menu - Settings - Import Multiple settings and select both RAW and .rpps files in the folder that you wish to process. The settings in .rpps files will be imported into RawPhotoProcessor History and the corresponding RAW files will be opened using the parameters you've set in .rpps files. FastRawViewer can set XMP ratings and XMP labels that are compatible with Adobe products (and other programs which support XMP). Ratings are set as a number from 1 to 5. The setting is changed via Menu– XMP Metadata or by pressing the 1…5 buttons in the XMP Metadata panel, or by pressing the buttons 1…5 in the XMP Metadata panel, or with the hotkeys (default keys are Alt-1...Alt-5). To clear the rating, please press [X] button in the upper row of the XMP Metadata panel, or you can also use Menu – XMP Metadata – No Rating or the hotkey (Alt-0). For the compatibility with Adobe Bridge FastRawViewer supports Reject rating (-1). To enable this, set Preferences – XMP – XMP – Ratings & Labels - Use XMP Reject rating to ON (this is also switched on automatically if XML Label style: Adobe Bridge is selected). As the result, the button [R] is displayed in the row for setting the rating, and the action Reject appears in the Label menu. Adobe Bridge style (Select, Second, Approved, Review, To Do). Adobe Lightroom style, color marks (Red, Yellow, Green, Blue, Purple). Adobe Lightroom ‘Review Status’ style (To Delete, Color Correction Needed, Good to Use, Retouching Needed, To Print). You can select the appropriate label style through Preferences–XMP – XMP – Ratings & Labels - XMP Label Style section. For the Custom style you can also edit the names for the labels. 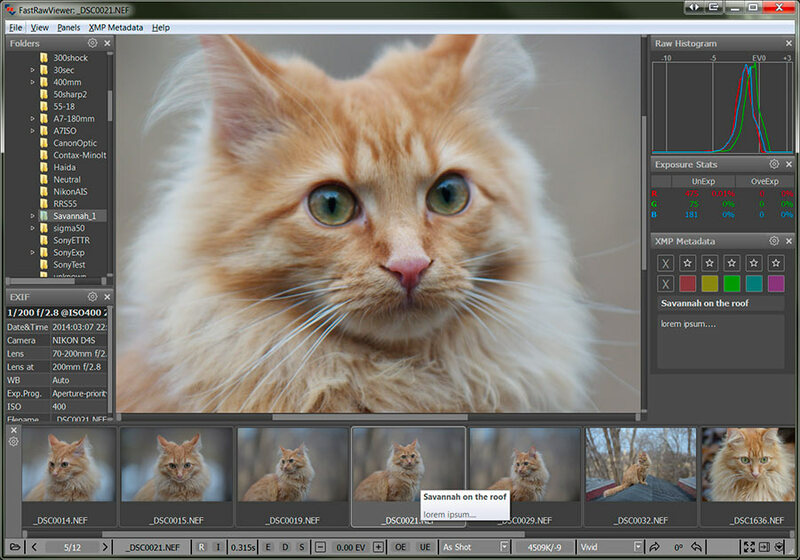 Setting and changing the label for the image is performed through Menu– XMP Metadata or by pressing the colored squares in the XMP Metadata panel, or using hotkeys (Alt-6-Alt-9). To delete the label, press the [X] button in the row for setting the label, or use Menu – XMP Metadata – Clear Label. When turning on the Read Only XMP mode, labels and ratings are read from XMP files, but the program prevents any changes to them. In Preferences – XMP - Ratings & Labels one can turn on the Visual Feedback on rating/label change setting. If this is done, visual feedback will be given in the form of a contrasting notification when changing a rating/label, occurring for about 1 second. FastRawViewer can record the title and description of the image in XMP files. The floating tooltip in the Filmstrip/Thumbnails panel.